Wuhan Head Coach J.W. Kenton was impressed with Li at the Austin, Texas combine. His size at 6-3, 235 and speed with a 4.66 in the 40 yard dash caught the eye of the coach. “He’s got a great motor and he’s only been playing football for three years,” Kenton said. Lee, who goes by the nickname of Bruce is 21 years old and could have many seasons ahead. 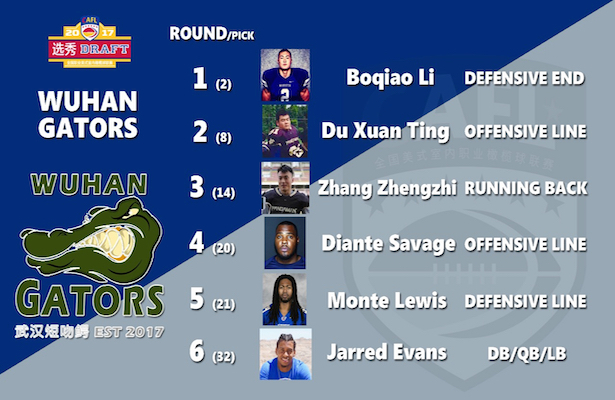 Du has played for teams in China and will look to fill the roster spot left vacant with the release of Collin Madison who helped coach Kenton’s team to lead the CAFL in rushing last season. Zhang was listed as a running back on his draft application but coach Kenton projects Zhang, who stands in at 6-3, 225, to play wide receiver or linebacker as there are roster spots open at each position. Last season coach Kenton proved that you can have success running the football in an indoor league and to drive home that point again Savage was his choice in the fourth round. By adding the likes of one of the top offensive linemen from the AFL’s Washington Valor, opponents will have to deal with a proven player who checks in at 6-5, 330. The former University of Oklahoma product played last season in the AFL with Arizona. Coach Kenton sees Lewis as a good fit. At 6-4. 250 coming from the Tampa Bay Storm of the AFL what’s not to like? Lewis, who played in college at Jacksonville State, is one of the sack leaders for the Storm and has a chance of make an impact in the CAFL’s second season. Coach Kenton likes Evans versatility as the former University of Cincinnati Bearcat has played both as a quarterback and defensive back. The Queens, New York native has a 6-0, 190lb. frame and was a member of the Green Bay Blizzard in the Indoor Football League.